Our city leashes are incredibly functional, featuring two trigger snaps and extra loops. You can easily secure your buddy to a post or tree while you run in to the coffee shop, and the extra loops are perfect to hold your keys or poop bags! Would you like to order a collar with your leash? 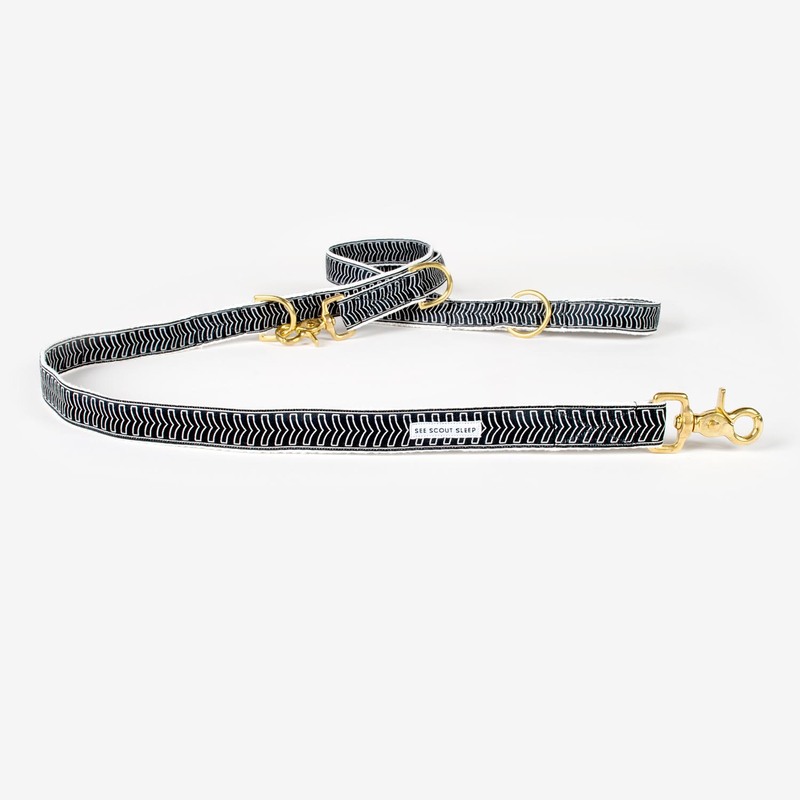 Our ½ inch width leashes match to our extra small and small collars and harnesses. Our 1 inch width leashes match to your medium, large, extra large and extra extra large collars and harnesses. We have a leash on life! Our adjustable city-leashes are strong, functional yet beautiful, and especially designed for world’s extraordinary pooches and their humans. Our adjustable city-leash makes it possible to adjust the leash length to every situation, may it be short during walks through busy areas, or long while going for a relaxed stroll in the park. Our city leash can also be worn cross body and has multiple trigger snaps, D-rings, and an O-ring which makes it super easy to clip on handy accessories like our pooch pouch or keychain. Our adjustable city-leashes can be machine washed. Please allow 10-15 days for production. This item is available in 1/2 inch | 1,3 cm and 1 inch | 2,5 cm. Adjustable city-leashes in 1/2 inch | 1,3 cm matches all our products in xs-s size. Adjustable city-leashes in 1 inch | 2,5 cm matches with all our products from m-xxl size. Each of our products are made with high-end, super durable materials from the United States and Western Europe. We design and create all of our products in-house, using imagination, an eye for detail and great workmanship. For our adjustable city-leashes we use nothing less then the best hemp webbing, brass hardware and our own designed ribbons. The hemp webbing we use isn't not only gorgeous and strong, it also has some extra special qualities: - it’s non-allergenic, breathable, durable, and has anti-bacterial properties. - it feels soft and comfortable on the skin. - it holds its shape and does not stretch like other natural fibers do. - it’s naturally resistant to mold.